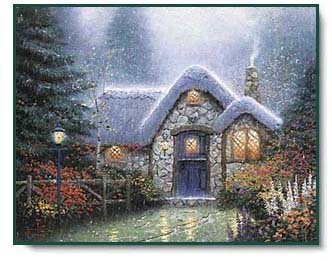 We offer different Framing Options for this Thomas Kinkade canvas. "Though born of the imagination, The Woodsman's Thatch is based on real cottages I've sketched during my travels in England. The design of this cottage features two rooms on the ground floor and a loft for sleeping. You can tell by the light in the window above the door that a child is probably reading fanciful stories before going to sleep. As I worked on this painting, I wanted to enhance the feeling of 'coziness' that seems to be the central mood, so I added a misty rain to lend softness and charm. 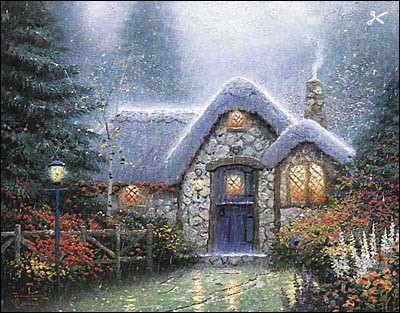 After all, what could be more cozy than a glowing cottage set in a misty forest?" The Woodsman's Thatch copyright© 1991 by Thomas Kinkade.